To Bottle Gooseberries, Curants, Plumbs, Cherries Having clean bottles Fruit pulled a little before ripe, fill the bottles quite full shaking them constantly while filling, put the cork in loosely, set them in a copper of cold water up to the neck then place them on the fire till the water is heated to 160 degrees keep them at that heat half an hour. Have a Kettle of boiling hot water, with which fill the bottles full so as just to admit the corks, Cork them tight imediately but gently but do not shake them for fear of breaking the bottles, set them in a cool place for use - given by Mr [Humphrey?] 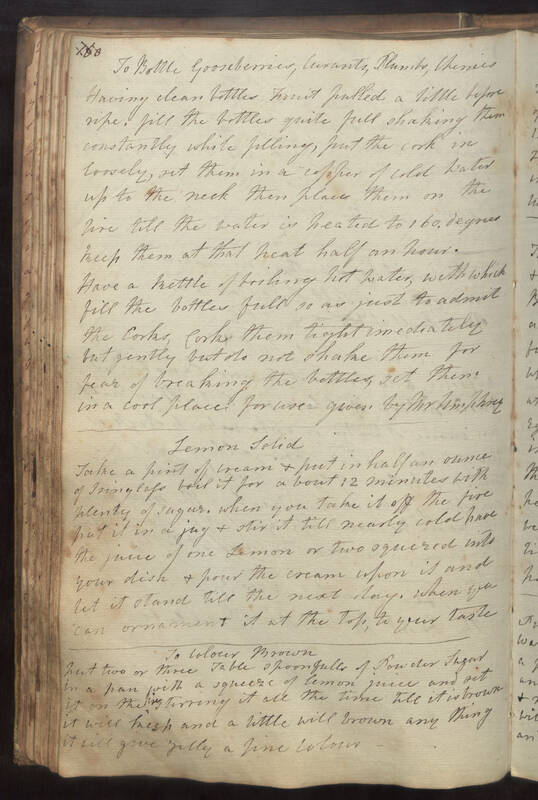 Lemon Solid Take a pint of cream & put in half an ounce of Isinglass boil it for about 12 minutes with plenty of sugar. when you take it off the fire put it in a jug & stir it till nearly cold have the juice of one Lemon or two squezed into your dish & pour the cream upon it and let it stand till the next day. when you can ornament it at the top, to your taste To Colour Brown put two or three Table spoonfulls of Powder Sugar in a pan with a squeeze of lemon juice and set it on the fire stirring it all the time till it is brown it will keep and a little will brown any thing it will give jelly a fine colour.